The UNC Eating Disorders Program would like to congratulate Reverend Peter Maffly-Kipp on receiving the national Julius W. Varwig Award. This award is presented annually to one United Church of Christ Professional Chaplain or Counselor “who has demonstrated dedication and commitment to serve persons … in the spirit exemplified by the first full-time Protestant chaplain in the United State, Rev. Julius W. Varwig.” Rev. Bill Johnson presented this award to Peter in a ceremony in the John M. Reeves All Faiths Chapel in Memorial Hospital Thursday morning. The number of former patients in the audience, as well as clergy, physicians, and nursing staff from various departments in the hospital, was testimony to how many lives Peter has touched. As one of Peter’s colleagues noted in the ceremony, everyone who knows Peter was “pleasantly surprised and yet not at all surprised” to find out that he was receiving this prestigious award. Peter was selected for the 2011 Varwig Award on the basis of his exemplary work in ministry at UNC Hospitals. Peter came to UNC Hospitals in 1990 and began his chaplaincy serving persons living with HIV. 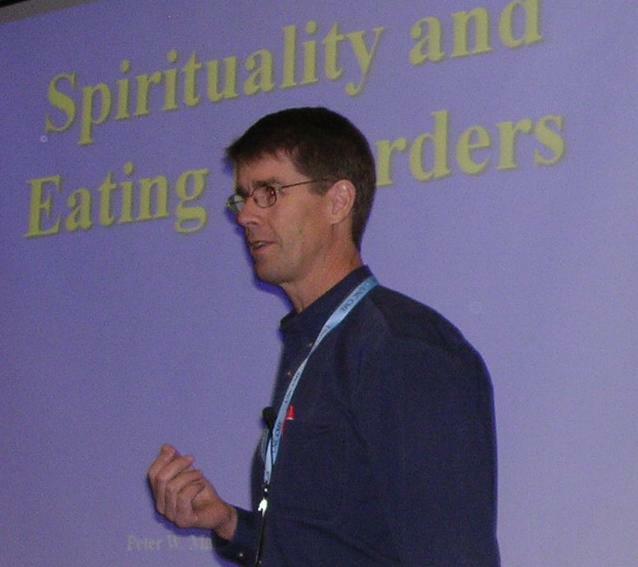 In 2004, Peter joined the Eating Disorders Program. He leads groups focusing on spiritual themes on the inpatient unit and in the partial hospitalization program and is available for individual counseling as requested. “When we opened our program in 2003, many patients spoke of the importance of spirituality in their recovery. Peter has helped add this dimension to our treatment and has ensured that there is always space for spirituality – regardless of its form – in the recovery process,” notes Dr. Cynthia Bulik, the Director of the Eating Disorders Program. Over the years, Peter has become an integral part of our interdisciplinary team. Peter brings an inspiring energy and enthusiasm to his chaplaincy and clinical work. Patients often describe how much they trust Peter and his group is often one of the most highly anticipated of the week. The UNC Eating Disorders Program is fortunate to have Peter as part of our team and we congratulate him on this national recognition. ← Jenni Schaefer’s new hit CD, phoenix, Tennessee, now available!